Get this striped cream and navy striped mohair knit jumper top which you can slouche off your shoulder with multi coloured speckle detail. 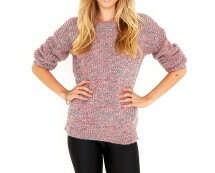 Team with some of our leggings or jeans either way it’s a must have for comfy casual wear. Fluffy and soft long jumper features two pockets, with a round neckline and long sleeves this is ideal for your winter wardrobe. Washable. 70% Acrylic, 30% Polyamide. Length approx. 68 cm (27 ins). 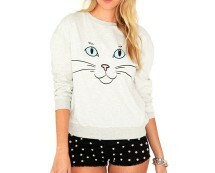 Put the fun back in to fashion with this quirky sweater featuring cute cat face, the perfect day time piece. Team with your favourite leggings for those chilled days where you just want to curl up on the sofa! 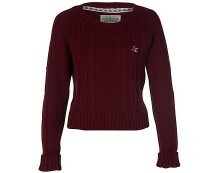 Grunge it up in this boxy knitted jumper while the mix of the coloured yarn adds a more feminine touch. Layer over one of our exclusive collared blouses to complete the look and embrace the trend.